TSPSC RJC Lecturers, Principals, PDs, Librarians Merit list Results released 2018 / TSPSC RJC Lecturers, Principals, PDs, Librarians Results, Main Exam dates 2018: TSPSC RJC Lecturers, Principals, PDs, Librarians Hall tickets,Exam date,Answer key, Results 2017/ TSPSC Residential Junior Colleges Principals, Lecturers, PDs, Librarians Recruitment 2017/ TSPSC Gurukulam Junior Colleges Principals, Lecturers, PDs, Librarians Recruitment 2017/TSPSC REIS Junior Colleges Principals, Lecturers, PDs, Librarians Recruitment 2017: It is raining jobs for the unemployed youth in the State with the Telangana State Public Service Commission (TSPSC) notifying 618 jobs through TSPSC Residential Junior Colleges Recruitment notifications on June 1. These posts details as follow. 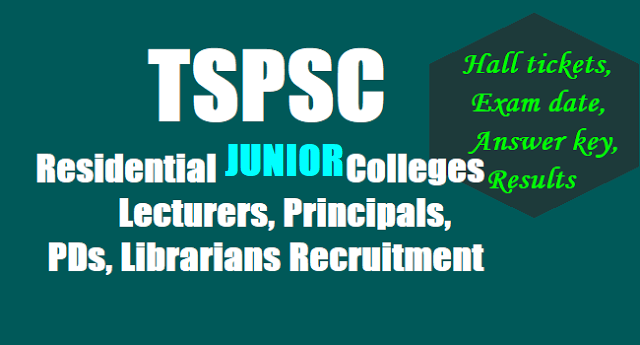 TSPSC Residential Junior Colleges Lecturers, Principals, PDs, Librarians Recruitment, Exam date, Hall tickets, Answer key, Results and more details on tspsc website. On the basis of Main Examination and subsequent certificate verification for the post of Physical Director in Junior Colleges in MJPTBCWREIS vide Notification No. 26/2017; the candidates with the following Hall Ticket Numbers are provisionally shortlisted for Interview at TSPSC Office from 10:00 AM. The candidates who are provisionally admitted for Interview are required to attend along with all Original Certificates, Hall-Ticket, (3) Pass port size photos and Verification Certificate which is issued by the Commission at the time of verification failing which, they will NOT be admitted in subsequent process of selection. The Interview is scheduled on 14/11/2018 in the Commission’s Office, Prathibha Bhavan, Opp. Gagan Vihar, M.J. Road, Nampally, Hyderabad. A copy of this result can also be seen on the Commission’s Notice Board. The candidates are hereby instructed to give their online zonal preferences i.e., Web options from 09/11/2018, failing which their candidature may not be considered for selection. Admission of the candidate is purely provisional and Commission reserves the right to cancel the candidature of a candidate at any stage, if filing of false information or suppression of facts or Conduct not in accordance with the terms and conditions of the Notifications is noticed. Hence admission to Interview does not confer ipso facto right for Final selection. TSPSC RDC Lecturers Results, Certificates Verification Dates: On the basis of Main Examination held on 18.05.2018 & 19.05.2018 for the Post of Degree College Lecturers in MJPTBCWREIS & TSWRDC vide Notification No. 22/2017,1473 candidates with the following Hall Ticket Numbers are called for Certificate Verification against total No. of 546 vacancies. The Certificate Verification is scheduled to be held from 28/08/2018 onwards. Day wise schedule &venue will be announced shortly . In order to avoid multiple phases of Certificate Verification, the Commission decided to conduct certificate verification for all the qualified Candidates as the number of candidates is not large .All the 1473 qualified candidates in 26 subjects are hereby called for Certificate Verification. The candidates who are called for Verification of Certificates have to produce the following certificates in original along with a set of Photostat copies duly attested by Gazzetted Officer at the time of Verification of Certificates, failing which, they will NOT be admitted in subsequent process of selection . No request will be entertained for subsequent submission of any of the required certificates. In terms of the Notification, the candidate should possess the requisite qualifications as on the date of the Notification. The Commission reserves right to disqualify any candidate, if he/she is not found eligible for any reason at any stage. Admission to Verification of Certificates does not confer ipso facto any right for Final selection. In order to avoid multiple phases of Certificate Verification, the Commission decided to conduct certificate verification for all the qualified Candidates as the number of candidates is not large. Therefore the candidates with the following Hall Ticket Numbers who have qualified in the main examination are called for verification of certificates, from 10.00 AM onwards. As per the above table The candidates who are called for Verification of Certificates have to produce the following certificates in original along with a set of Photostat copies duly attested by Gazzetted Officer at the time of Verification of Certificates, failing which, they will NOT be admitted in subsequent process of selection . No request will be entertained for subsequent submission of any of the required certificates. In terms of the Notification, the candidate should possess the requisite qualifications as on the date of the Notification. The Commission reserves right to disqualify any candidate, if he/she is not found eligible for any reason at any stage. Admission to Verification of Certificates does not confer ipso facto any right for Final selection. 6 Certificate of NET(UGC/ CSIR) /SLET. TSPSC RJC Lecturers, Principals, PDs, Librarians Answer Key, Merit list Results to be released 2018: Degree College Lecturers, Physical Directors in Degree Colleges, Librarians in Degree Colleges, Physical Directors in Junior Colleges, Junior College Lecturers & Librarians in Junior Colleges, vide Commission’s Notfn Nos. 22/2017, 23/2017, 24/2017, 26/2017, 27/2017 & 28/2017:: TSPSC has conducted Main Examination for the above notifications from 12/05/2018 to 19/05/2018. The Final Keys of these notifications will be available on TSPSC website from 01/08/2018. No further objections will be received on Final Keys. Of the total vacancies for which notifications were issued, posts of Junior college lecturers in Residential Educational Institutions Society (REIS) constitute the maximum with 152 vacancies, remaining Junior College Principals: 06 vacancies, Junior College Physical Directors: 08 vacancies, Junior College Librarians: 42 vacancies. These notifications have come as a bonanza for unemployed youth in the State. Youngsters had been eagerly waiting for notifications to posts of Junior college lecturers, principals, PDs and Librarians in government-run colleges. Submission of online applications for all these notifications will commence from June 6 and the last date is June 24 for some notifications and July 11 for a few. The Commission also announced tentative dates for conducting preliminary screening test for posts in REIS on July 16. The Commission, which said it intends to complete the recruitment process by August-end, advised candidates to visit its website www.tspsc.gov.in for detailed information, for submission of online application and dates of examinations.